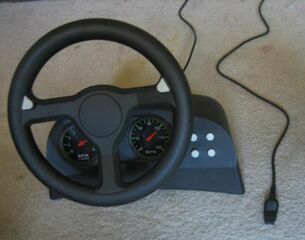 The Per4mer Turbo Wheel is a third-party steering wheel controller created by Home Arcade Systems for a variety of home systems, including the Sega Mega Drive and Sega Saturn. The Saturn version is known to come with pedals, though it is unclear whether this also applies to the Mega Drive version. Both variants of the Per4mer are rare. The Saturn version is expected to be a fairly unremarkable steering wheel (and one of many readily available), but the Mega Drive variant likely stands as the only racing controller for the system. The Mega Drive version is known not to be strictly analogue, more likely working as a glorified turbo switch (e.g. the more you turn left, the faster the device sends a signal to the console). Whether similar methods are applied to other versions is not known. Per4mers were also released for the IBM PC, SNES, 3DO, PlayStation and Nintendo 64.